Click "Add Calendar -> Add Google Tasks" on the File menu. Right-click in the Calendar List and select "Add Calendar -> Add Google Tasks" from the popup menu. VueMinder can sync tasks with Google Calendar. Tasks defined in Google Calendar will appear in VueMinder, and vice versa. Each "task list" in Google Calendar is equivalent to a task calendar in VueMinder. You can define multiple task calendars and automatically sync them with Google Calendar. 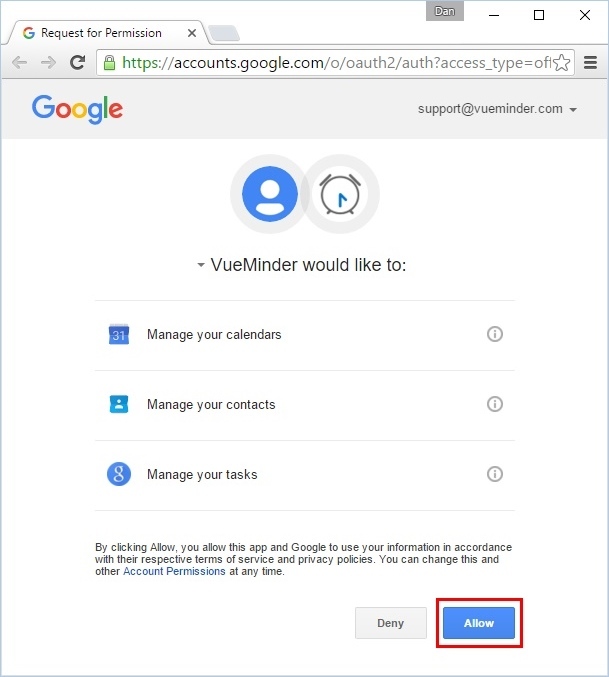 All the advanced capabilities of VueMinder can also be used for your Google tasks, such as SMS reminders, importing or exporting tasks to Excel, emailing tasks, etc. Note: The Add Google Tasks window is used to add existing Google task lists to VueMinder. If you have a task calendar in VueMinder that you'd like to add to Google Calendar, syncing can be enabled on the Google Tasks tab of the Task Calendar Properties window. To add an existing task list from Google Calendar to VueMinder, use the "Add Calendar -> Add Google Tasks" command on the File menu. Before using the "Add Google Tasks" command for the first time, make sure you're logged into the desired Google account in your web browser. If Google Tasks or Calendars have not been added previously, a web browser will open where you might need to enter your Google login information. If you're not already logged into a Google account, a secure web page will prompt for login. After logging into Google, another page will appear requesting permission to access your Google calendars, contacts, and tasks. Click the "Allow access" button and then close the web browser. This only needs to be done one time. The Google task lists will be shown. To add a Google task list, click the list name and then click the "Add Task Calendar" button. Tasks will automatically appear in VueMinder within a few seconds. There are also some settings that can be adjusted prior to adding the task calendar. The sync frequency can be set to sync automatically every hour, every day, or manually. 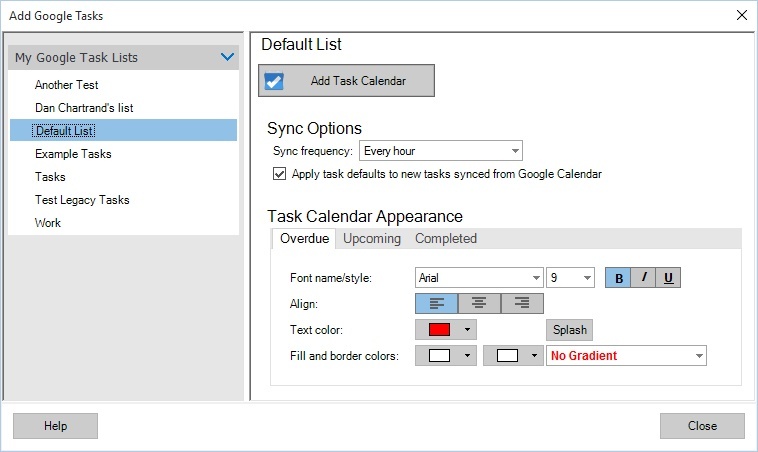 A checkbox enables the default settings specified on the "Task Defaults" tab of the Task Calendar Properties to be used for any new tasks that are added to Google Calendar and then synced to VueMinder. Default settings could include default reminders, priorities, categories, etc. The task appearance colors for overdue, upcoming, and completed can also be adjusted.